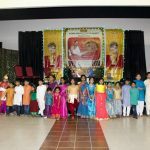 With the grace of Lord Krishna and Sri Sri Sri Swamiji, Houston was blessed with a blissful eight days of Bhagavad smaranam during Thanksgiving week, thanks to Sri Ramanujamji. Several satsang members from across the US also visited Houston for the programs and made the event a very memorable reunion. The day program for the first couple of days was held at the residence of Smt. Hema and Sri Gopal Salvady, and the remaining days’ programs were held at the residence of Smt. Lekshmi and Sri Jeevan Nair. The days began with Mahamantra kirtan and prabodhanam to Sri Premika Varadan and Madhuri Sakhi, and the Holy Padukas of HH Sri Sri Muralidhara Swamiji. This was followed by more Mahamantra kirtan and bhajans by all the devotees. Then Ramanujamji led the daily Srimad Bhagavatam parayanam, and followed it up with wonderful Bhagavatam pravachan in his own inimitable style, that immersed everyone completely in the bliss of Bhagavan’s glory. 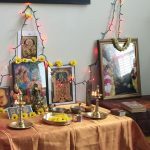 He spoke in detail on various stutis and charitras from the Bhagavatam including Bhagavata Mahatmyam, Narada charitra, Kunti stuti, Vritrasura charitra, Ajamila charitra, Prahlada charitra, Gajendra stuti, Krishna Jananam and Rukmini Kalyanam. On Wednesday (Nov 25) night, Divya nama sankirtan was performed ecstatically by all the male devotees as everyone present joined in Nama sankirtan and singing the glories of the Lord. 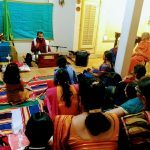 On Friday night, Nov 27, Mahila Divya Nama sankirtan was conducted where it was the turn of the women devotees to sing and dance to the Lord’s tunes. 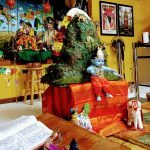 On Saturday night, on the auspicious occasion of Ekadasi, Ramanujamji led all the devotees in a wonderful sampradaya bhajan session, which followed the specific format used by Sri Swamiji himself. Ramanujamji interspersed the bhajans with beautiful explanations of the songs that made the rendering even more meaningful and filled everyone’s hearts with joy and happiness as the Lord’s glories reverberated melodiously everywhere. 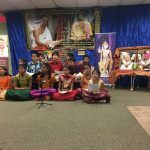 We in Houston are very thankful to Sri Ramanujamji for bringing us the bliss of Sri Swamiji’s satsang and we are also grateful to all our satsang brethren who came all the way to Houston specifically for this event for making the occasion so memorable.